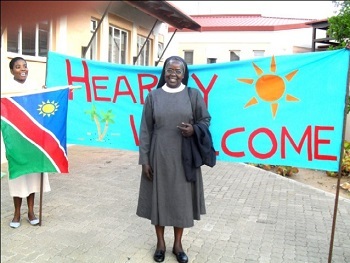 On December 18, 2013, I set off for my new mission Windhoek Priory. As the South African Airline landed at Entebbe Airport in Uganda my heart calmed that indeed, “I am going to my mission.” It was a smooth trip from Entebbe to Johannesburg. The officer accompanying me for the passport control and visa had already told me there was a big group of Sisters waiting for me outside, which added to my joy. It was such a welcoming gesture of Mother Maria Ignatius, three Perpetually Professed Sisters and six Novices. On the highway, the beautiful roads and the green mountains of Windhoek made it more beautiful. Arriving to the Priory House in Nubuamis, I felt so small when I saw a big group of Sisters and Formandees with a banner, drums and all kinds of African instruments welcoming me. I am now feeling at home two weeks after my arrival here. I have been impressed by the graceful atmosphere of Ora et Labora in both young and old. I have already celebrated my first Christmas here. The liturgy has been beautifully blended by both Namibian and European music.